“In that third year of the Kennedy Presidency* a kind of fever lay over Dallas County. Mad things happened. 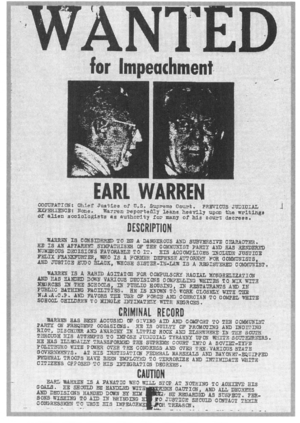 Huge billboards screamed “Impeach Earl Warren.” Jewish stores were smeared with crude swastikas. Fanatical young matrons swayed in public to the chant, “Stevenson’s going to die–his heart will stop, stop, stop and he will burn, burn burn!” Radical Right polemics were distributed in public schools; Kennedy’s name was booed in classrooms; junior executives were required to attend radical seminars. Dallas had become the mecca for medicine-show evangelists of the National Indignation Convention, the Christian Crusaders, the Minutemen, the John Birch and Patrick Henry societies . . . In Dallas a retired major general flew the American flag upside down in front of his house, and when, on Labor Day of 1963, the Stars and Stripes were hoisted right side up outside his own home by County Treasurer Warren G. Harding–named by Democratic parents for a Republican President in an era when all Texas children were taught to respect the Presidency, regardless of party–Harding was accosted by a physician’s son, who remarked bitterly, “That’s the Democrat flag. Why not just run up the hammer and sickle while you’re at it?” – William Manchester, Death of a President. *My personal take is that Obama has appeased the financial folk enough of late to avoid Kennedy’s fate. JFK, after all, foolishly tried to take back the making of money from the Fed in June of 1963 and messing with Wall Streets supplier is never a good political move.